I bought an Android phone just to check it out (’cause that’s what I’m supposed to do; my friends count on me for that.) I bought it in spite of that fact that I hate T-Mobile, in spite of the fact that the Android didn’t support Microsoft Exchange or view PDFs or let me view and edit Microsoft Office documents, and in spite of the fact that T-Mobile wanted to assign me a “ghetto” 510 area code number. None of that mattered. I just wanted to see it. I had 30 days to return it and that’s what I’d do. What a surprise! After spending 100 hours playing with the phone (downloading software, configuring things, hooking up external devices, even making some phone calls), I had to admit I was in love. Goodbye, Sprint! Nothing else matters. In contrast, the Android is designed to be open. There are hundreds of programs available for it, most of which are free, and they all play well together by design. You can add and remove them at the touch of a button without ever having to deal with your carrier. “Who needs zillions of programs on their phone?”, you ask. Well, there’s one that can use the camera to take a picture of a book or a CD and find the lowest prices for that item in nearby stores and on the Internet. Take that, William Shatner! There’s an augmented reality program that uses the camera to display whatever you are looking at on the screen, drawing labels over the picture in real time to identify what you are seeing. It will point out Angel Island, the Golden Gate Bridge, Coit Tower, San Quentin, and so forth. A similar program identifies the stars and constellations as you point it around the night sky. Around the house, you can snap pictures of barcodes as you run out of things and it will put them on your shopping list. There’s a compass and a runner’s log and even an audio editing tool to make your own ring tones. It’s a camera and a GPS and a voice recorder, plus email and a web browser. 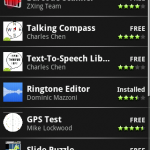 It has visual voicemail, newsreaders and music and podcast players, Skype and Twitter clients. Oh yeah, and it’s a phone! Plus, if you ever lose it, you can send it a text and it will tell you where it is. There’s also a bunch of games for it, but I’ve been having too much serious fun to play with them. Why Android and Why Now? There’s no end to the creativity people are demonstrating with the Android, but why this platform and why now? Because Google and the Open Handset Alliance found a secret formula for harnessing the creativity of developers. First of all, they built a device that has all the hardware you need to do interesting things. It has a GPS, a 3-axis accelerometer and a magnetic compass, WiFi, 3G networking, and bluetooth, a touch screen and a keyboard, speaker and a processor with video and music capability. If you can’t have fun with all that, then you shouldn’t be programming. It even has a multi-color LED. Secondly, they created an operating system that works like a Lego set, making it easy to build programs out of pieces of stuff that you and your friends have done before. Need a map of your current location? Just call one up. Need to play an alarm tone at a certain time? There’s a system service for that. The Android platform is still in its infancy, but it’s remarkable how quickly the market is maturing. It seems clear that Android’s operating system is going to break out of the phone and spawn a whole new generation of portable computers that will replace the laptops of today. 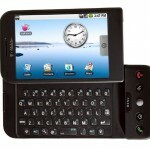 In short, netbooks are going to fall in love with Android, too. Chip manufacturers are already tooling up and companies like HP are making early announcements. I think Android as a new computing platform makes perfect sense. After living on the Android for a week, my big, fast Windows machine feels clunky and out of date. 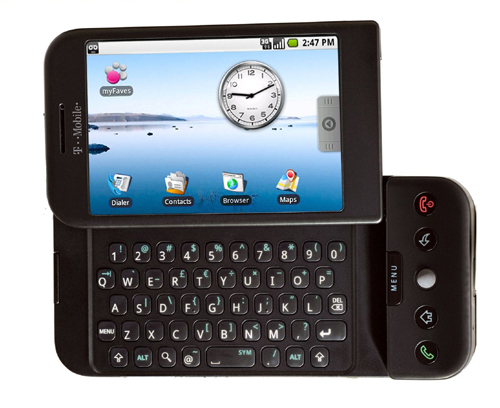 If the Android had a little bit bigger keyboard and screen, I’d use it for everything, relegating my Windows machine to really big jobs like video editing, 3D modeling, and first-person shooters. And what about the iPhone? A beautiful product for sure, and a terrific success story for the company, but once again Apple is headed in the wrong direction by vertically integrating. Silly boys, the future is open! But that’s a story for another time. Love the article. I’m looking for posts like this to publish on my site. Would you allow me to publish this with a link back to your site? Awesome article… Now I have my eye set on Android… I’ve never really looked too hard at the phone technology that is out there. I have a Crackberry that is used for work/personal, but it costs too much to load the thing with apps… I am so ready for open usage!!! You should do a follow up article. Since I’m reading this a year later I’ve already been through the excitement of the Droid on Verizon and the Nexus One craze that swooped in right before CES 2010. I too am in love with Android and all the goodness that comes with it. Plus with versions 2.0 and 2.1 many new goodness has been added…like free turn by turn navigation and the like…I don’t own one yet but as soon as my contract is up I’m going over to Android.